I made the mistake of washing my 3 year old son’s “blanky” while he was still awake! I made that mistake once too. I was forgiven. He looks so sad. It makes for cute pics though. Awww.. a while is certainly seems like eternity for a kid.. Hope his blanket came out fresh and soft from the wash.
Aw, poor little guy! He must really love his blankie! Ahh that is so sad, kids are so funny ow they get attached to blankets or a stuffed toy!! Been there, done that. Seems like the washer goes extra slow when the blanky is in there! Oh poor baby. My youngest granddaughter had a blanky and she finally lost it (Mommy and Daddy hid it) and she stopped sucking her thumb when she didn’t have her blanky any more. She would cry while it was washing and drying too. Little ones are so cute with their comfort items. Awwwwwwwwww!! How sad!! but I’m sure he loved it more when it was all clean! my oldest had a favorite blanky & it was sad when it had to go bye… but the youngest never had one. I hope he is happy with a nice clean blanky. I hope he got back his blanky quickly. I am sure then he would have been thrilled that it was fresh and clean. Thanks for hosting. Oh dear, poor little fella! Bet you don’t make that mistake again! Aw, poor little guy. He must have been pretty happy to get it back though, all nice and clean! Poor baby, I feel his pain! I’d love to see the after photo. 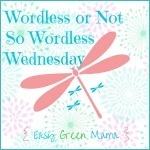 🙂 Happy Wordless Wednesday, grabbed your button! Aww, that’s too sweet. My kids are not really attached to anything in particular. Poor kiddo! We just went through something similar… Only mama left blankie in the laundry basket, dirty and forgot. That was until bedtime when she was asking for it… oops! OH..we have all done that. Poor little guy, they become so attached! Once, when we were at the beach, Blankie had been inadvertently left at home. My husband had to “call Blankie” to be sure she was OK and to tell her we would be home soon before our daughter would calm down!